For more information on our Progress Hybrid Wood Stove, click here. 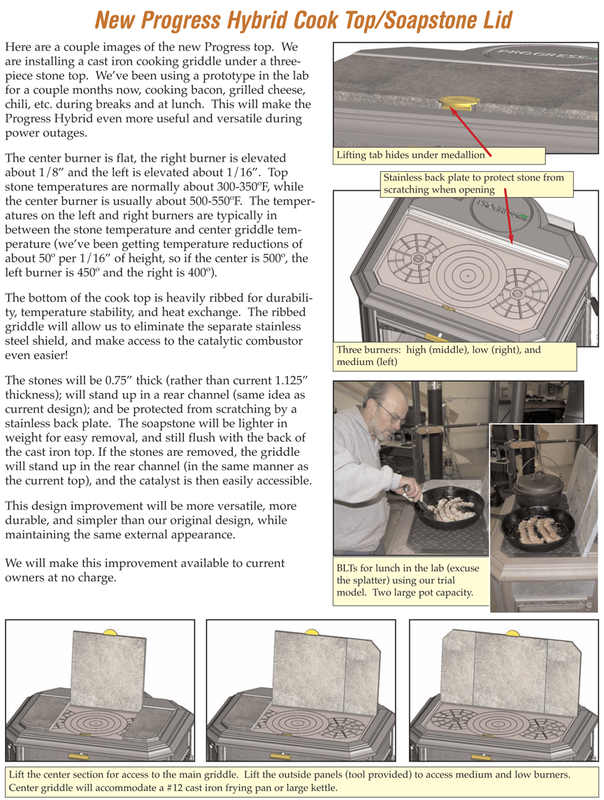 Trying to read about the cook top/ soapstone lid but can't click on the image to get a full page view so I can read the text. I just tried clicking on the image and it came up larger, but I did have to wait a few seconds for the image to load. 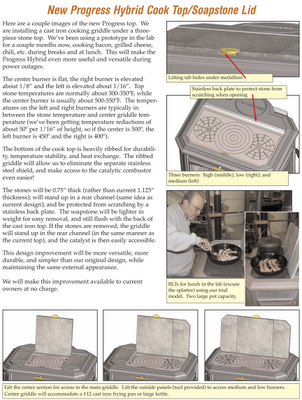 If this still doesn't work, please email info@woodstove.com and I can email you a PDF version. Never mind. tried a couple more times. it's a single click not a double. still hard to read though. I'll figure it out. Can the cooktop be retro-fitted on a Fireview stove? At the time we bought our stove you didn't offer the Hybrid model. It would be a nice feature to have on the Fireview. Thank you for your question. This question is one that we've been asked many times since the introduction of the Progress cooktop. The Progress cooktop was specifically sized to fit and seal the surface of that stove and will not retro fit onto the Fireview. If we have an opportunity to enhance the Fireview in the future a cooktop would definitely be up for consideration.